The C30 hatchback from Volvo is enjoyable to drive, and as you'd expect, features a comfortable and refined cabin. 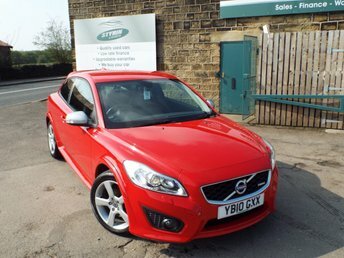 If you're in the market for an attractively priced hatch then be sure to take a close look at the range of used Volvo C30 models for sale in Leeds today. Here at Styrin Motors Limited we offer an excellent array of vehicles, each of which is put through a thorough inspection process before going on sale. Call the showroom now to discuss your requirements in more detail, or to organise a test drive in the vehicle of your choice. Finance is available to UK residents aged 18 years or older, subject to status. Terms & Conditions apply. Indemnities may be required. Other finance offers may be available but cannot be used in conjunction with this offer. We work with a number of carefully selected credit providers who may be able to offer you finance for your purchase, commission may be received. We are only able to offer finance products from these providers. Postal Address: Styrin Motors Limited, Off Whitehall Road, Gildersome Lane, Leeds, West Yorkshire LS12 6JJ. Find contact details here. Styrin Motors Limited is authorised and regulated by the Financial Conduct Authority, FRN: 650571. All finance is subject to status and income. Written Quotation on request. We act as a credit broker not a lender. We work with a number of carefully selected credit providers who may be able to offer you finance for your purchase. We are only able to offer finance products from these providers.